I updated my Catholic Google Calendar for 2016. My company volunteered at Special Olympics Texas. My second post on Wunderlist + GTD was not as long and is not quite as popular (yet) as the original, but it is published. My visit to West Coast night at the Fed was pretty great. I rang in the new year dancing! That is a lot more than I thought I’d have to share. My life got kicked into high-gear a little bit in December, but it is so much better than my days of being at home every night that I’m grateful for the flurry of activity. Did you make it through December okay? I took a hip-hop West Coast Swing workshop (my first dance workshop ever), and it was delightful. WCS dances well to hip-hop music, so we learned how to add some hip-hop moves into regular WCS patterns. I spent Thanksgiving with an old friend and his new wife. A few international Ph.D. students rounded out the dinner guests, so, for once, I wasn’t the only person who doesn’t understand football but watched it anyway. I finished my fall Bible study, on the Book of Revelation, just last night. I feel like this sunk in much better than reading The Lamb’s Supper or the young adult book club I was in when I read that book a few summers ago. Maybe Scott Hahn is just not my jam. I think that’s it. Looking forward, my company’s Christmas party is on a Thursday, so I’m not taking my regular dance classes this month at all, but I might check out another local dance event. My brother requested his Christmas present on Cyber Monday, but I still have to do all the rest of my shopping. I made out like a bandit with Epiphany cards last year, so that’s still the plan this time around. The great thing about December holidays is that everything is both gearing up and slowing down. I’ve got some solid end-of-year plans in mind. Even if 2016 is no better than 2015, this year was good enough to repeat! 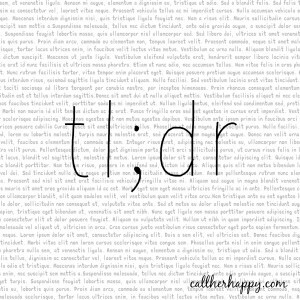 Jenna hasn’t hosted a link-up for tl;dr in a long time, but I still like the concept. It seems more efficient than a regular monthly wrap-up, and it encourages me to include things I didn’t necessarily blog about. On to it! I went to the lake (well, next to the lake). Some friends and I saw Hairspray at Zilker. The tradition continues! Dance class is still going well. I went to my studio’s no-cover social on Friday night to really break in my new dance shoes. It was ridiculous amount of fun. One more month and I’ll move on to Level 3! I’ve mostly just been taking care of business, I guess. Not much to report. Check out other lightning-fast recaps at Call Her Happy. I wrote a well-received (I think) essay about why single life is not a vocation. I finally posted the next installment in my Pope Francis #Synod14 series. I guest posted for my friend Christina about advice for maintaining friendships between married and single women. I went to an Ordinary Form Latin Mass at a nearby parish. It was the most fun I’ve had getting that exhausted in a long time. I read a really solid book about ending the death penalty. I have trip to see Hairspray at Zilker Park coming up. If the weather continues to be this mild (mid-90’s instead of our usual string of 100’s), hopefully my mood will stay up, too! It was Lent. I did some things and did not do other things. I went to church a lot and think I am a slightly better person now than I was on Ash Wednesday, so I’m calling it a win. I paid off my oldest student loan. YNAB is the best! I uninstalled SiteMeter because it jacked up my whole blog. I wrote a guest post about the Morning Offering, because evangelizing about the Apostleship of Prayer never stops. Big Pulpit linked to one of my reviews for Austin CNM. I played Cards Against Humanity for the first time. It is not a super Christian-friendly kind of thing, but the idea of Harry Potter and the Chamber of Inappropriate Yodeling is pretty funny. It was a month of much activity. I have some big fun things planned for April, so I hope to have lots of happy news next month. What have you been up to?